For other uses of "Petrozavodsk", see Petrozavodsk (disambiguation). Petrozavodsk (Russian: Петрозаводск, IPA: [pʲɪtrəzɐˈvotsk]; Karelian, Vepsian & Finnish: Petroskoi; Finland Swedish: Petroskoj) is the capital city of the Republic of Karelia, Russia, which stretches along the western shore of Lake Onega for some 27 kilometers (17 mi). Population: 261,987 (2010 Census); 266,160 (2002 Census); 269,485 (1989 Census). It was previously known as Petrovskaya Sloboda (until 1777), Petrozavodsk (until 1941), Äänislinna (until 1944). Archeological discoveries in the urban area indicate the presence of a settlement as far back as seven thousand years ago, and during the Middle Ages the site of modern city was marked by several lakeside villages. Within the city limits, the district of Solomennoje appears in surviving records dating back to the sixteenth century, and a map produced by the Flemish cartographer Abraham Ortelius at the end of that century places a settlement here called Onegaborg on the site of modern Petrozavodsk. On September 11, 1703, Prince Menshikov founded the settlement of Petrovskaya Sloboda ("Petrine Sloboda"). He did so at the behest of Tsar Peter the Great, who needed a new iron foundry to manufacture cannons and anchors for the Baltic Fleet at the time of the Great Northern War (1700–1721). At first the foundry used the name Shuysky zavod (literally, "factory at the Shuya River"), but a decade later it became Petrovsky zavod ("Petrine factory"), after the name of the reigning monarch. From this form the present name of the city derives. By 1717, Petrovskaya Sloboda had grown into the largest settlement in Karelia, with about 3,500 inhabitants, a timber fort, a covered market, and miniature palaces of the Tsar and Menshikov. The town's best-known landmark became the wooden church of Saints Peter and Paul, rebuilt in 1772 and renovated in 1789. The church retained its original iconostasis until this relic of Peter's reign was destroyed by fire on October 30, 1924. After Peter's death, Petrovskaya Sloboda became depopulated and the factory declined. It closed down in 1734, although foreign industrialists maintained copper factories in the vicinity. The industry revived in 1773 when Catherine the Great established a new iron foundry upstream the Lososinka River. Designed to provide cannons for the ongoing Russo-Turkish Wars, the foundry was named Alexandrovsky, after Alexander Nevsky, who was considered a patron saint of the region. The factory was modernized and expanded under supervision of Charles Gascoigne in 1787–96. Local pundits claim that the first railway in the world (чугунный колесопровод) was inaugurated for industrial uses of the Alexandrovsky foundry in 1788. During Catherine's municipal reform of 1777, Petrovskaya Sloboda was incorporated as a town, whereupon its name was changed to Petrozavodsk. A new Neoclassical city center was then built, focused on the newly planned Round Square. In 1784 Petrozavodsk was large enough to supplant Olonets as the administrative center of the region. Although Emperor Paul abolished Olonets Governorate, it was revived as a separate guberniya in 1801, with Petrozavodsk as its administrative center. During the Finnish military administration of East Karelia in the Continuation War (1941–1944), the city was styled as Äänislinna (or Ääneslinna), rather than the traditional Petroskoi. 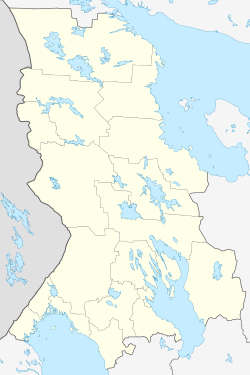 The new name was a literal translation of Onegaborg, the name of a settlement marked on a 16th-century map by Abraham Ortelius near the present-day city, Ääninen being the Finnish toponym for Lake Onega. Petrozavodsk is the capital of the republic and, within the framework of administrative divisions, it also serves as the administrative center of Prionezhsky District, even though it is not a part of it. As an administrative division, it is incorporated separately as the city of republic significance of Petrozavodsk—an administrative unit with the status equal to that of the administrative divisions of the Republic of Karelia. As a municipal division, the city of republic significance of Petrozavodsk is incorporated as Petrozavodsky Urban Okrug. Petrozavodsk is distinguished among other towns of North Russia by its Neoclassical architectural heritage, which includes the Round Square (1775, reconstructed in 1789 and 1839) and the Alexander Nevsky Cathedral (consecrated in 1832). Among the town's landmarks are the outdoor statues of Peter I (bronze and granite, Ippolit Monighetti, 1873), Gavrila Derzhavin (a Russian poet who was the governor of Olonets in the 18th century), and Alexander Nevsky (erected outside Alexander Nevsky Cathedral in 2010). Petrozavodsk is home to the Karelia Philharmonic Orchestra (1933), the Karelian Musical Theater (1955, statuary by Sergey Konenkov), National Library of Karelia (1959), Finnish-speaking National Theatre of Karelia (1965), Petrozavodsk State University, a conservatory, a city museum founded in 1871, and a branch of the Russian Academy of Sciences. One of the city's central landmarks is Lenin Square, an oval space with a large Soviet-era statue of Lenin in the center. The square is especially notable for English-speaking visitors because it is also called "round square" - an oxymoron in English, but not in Russian (kruglaya ploshad). The village of Shoksha near Petrozavodsk contains a quarry of red and pink quartzite which was used in construction of Saint Isaac's Cathedral and Lenin Mausoleum, among many other notable structures. There are also other quarries in the region excavating road aggregates (Goloday Gora – gabbro-diabase) near Derevyanka. The suburb of Martsialnye Vody is the oldest spa in Russia, founded by Peter the Great in 1714 and visited by the Tsar on four occasions. Its name means "The Waters of Mars" in Russian. Although Peter's palace at Martsialnye Vody has not survived, there is a museum devoted to the spa's history. From Petrozavodsk harbor a hydrofoil service of "KareliaFlot" company carries people to the island of Kizhi, a World Heritage Site with an outdoor museum of ancient wooden architecture. The city is served by the Petrozavodsk Airport, and a train station on the Murmansk Railway with train connections to the main population centers of Russia. An international tourist route Blue Highway goes through Petrozavodsk. Under the Köppen climate classification, Petrozavodsk experiences a subarctic climate (Dfc), though unlike most localities with this type of climate there is no permafrost and relatively moderate temperatures thanks to the moderating influence of the Baltic Sea and the many nearby lakes. Winters, though long and cold, are mild for the high latitude, while summers are short and warm. Precipitation averages 611 millimetres or 24.06 inches annually. ^ Петрозаводск. Официальный сайт (in Russian). Archived from the original on August 23, 2011. Retrieved June 27, 2014. ^ "Pogoda.ru.net (Weather and Climate-The Climate of Petrozavodsk)" (in Russian). Weather and Climate. Retrieved February 12, 2017. ^ "Petrozavodsk Climate Normals 1961–1990". National Oceanic and Atmospheric Administration. Retrieved February 12, 2017. Wikivoyage has a travel guide for Petrozavodsk. Wikisource has the text of the 1879 American Cyclopædia article Petrozavodsk.